Creating a vision board for the year can lead to greater clarity, focus, and intention in our lives. This is a practice I have been doing for myself for years and for the first time I will be teaching it in a workshop style, in my own artsy way, with all the materials to make your own 2019 vision board included. 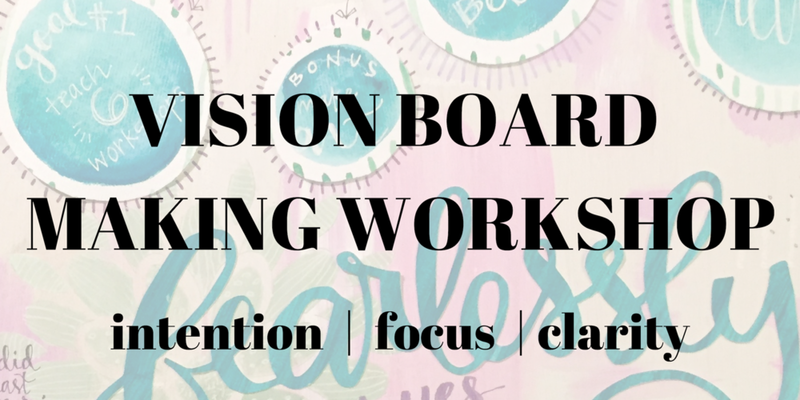 Every person who attends will receive their very own vision board kit, complete with a 15"x15" wood board with two backgrounds to choose from (pre-painted by me, like the one shown in the example here! ), cut-out hand-lettered words of encouragement (take the 1-minute survey to chime in on which words you'd like to be part of the first kits this year! ), paints, brush markers, metallic paint markers, sharpies, watercolor cut-outs, and other fun mixed media bits for your inner artist's enjoyment! In this 2 and a half hour relaxed workshop, you'll leave with a dose of encouragement for whatever path or season you're in right now. Whether you're a stay at home mom, an entrepreneur, an employee, an ambitious lady ready to take on the world, or any other kind of driven woman, this workshop will help you think about what you did well last year, what you'd like to accomplish this year, what you'll measure your success by, and to put it all down on your own pretty board that you can mount in a prominent place where you'll see it every day. In this workshop, I'll share how every year my goals include keeping Jesus at the center of everything I do and practical ways for you to incorporate more of Him into your everyday life, regardless of how busy you are. CAN’T MAKE IT TO THIS ONE? SIGN UP FOR ONE OF THE NEXT ONES! Email me to save your spot!